It’s October so you know what’s coming up! It’s almost Halloween and we have some scary good drinks this year. Looking for a place to celebrate this exciting holiday? Come now to try our innovative “boos”! 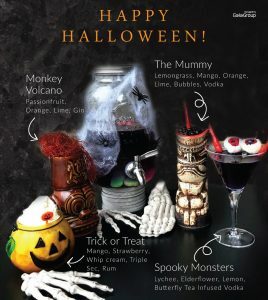 Check out our Halloween special cocktail list created by our very own bartenders. You can find these drinks at Glasshouse, Greenhouse, Townhouse, and Elements Greyhound Cafe. Coming up this month we will also be having Halloween events on October 26 and 27 at Townhouse in California Tower, Lan Kwai Fong. Stay alert for our next newsletter coming very soon!